U.S.-backed and Kurdish-led Syrian forces said Sunday they are locked in a fierce battle to take over the final territory controlled by ISIS in eastern Syria. The Syrian Democratic Forces (SDF), supported by U.S. air attacks, have successfully overtaken the terror group, which gained control of large swaths of northeastern Syria in 2014, NPR's Lama Al-Arian reports for our Newscast unit. "IS counterattack was foiled at 4 am this morning," Bali tweeted on Sunday morning. "Heaving fighting is going on inside the last village at the moment." 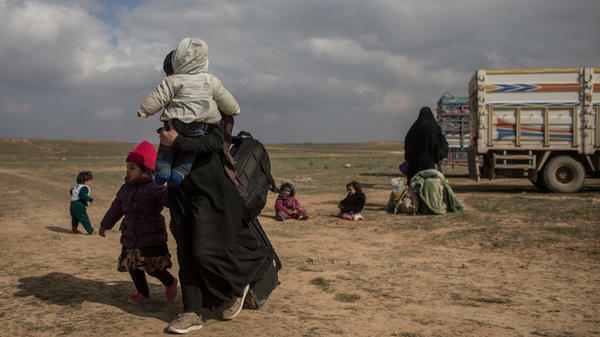 Al-Arian reports that despite efforts to help civilians flee the area, hundreds are reportedly still stuck inside. The Syrian Observatory for Human Rights, a group that monitors human rights abuses in Syria, said SDF forces are moving "cautiously" because of ISIS-planted mines. While Bali is describing the offensive as the "final battle" against ISIS, the extremist group still holds some territory in the area south of Damascus largely controlled by the Syrian government, according to Reuters. ISIS previously controlled a huge section of Syria and Iraq, declaring a caliphate in 2014 and making billions of dollars from oil revenue, extortion and kidnapping. Since 2011, Syria has been embroiled in a violent civil war, which created a safe haven for extremists and allowed ISIS to spread quickly. But the fall of two major cities – Syria's Raqqa and Iraq's Mosul – in 2017 marked the beginning of the group's loss of ground. The head of U.S. Central Command, Gen. Joseph Votel, cautioned against a quick withdrawal last week, telling the Senate Armed Services Committee, "the fight against ISIS and violent extremists is not over and our mission has not changed." "The coalition's hard-won battlefield gains can only be secured by maintaining a vigilant offensive against the now-largely dispersed and disaggregated ISIS that retains leaders, fighters, facilitators, resources and the profane ideology that fuels their efforts," Votel added. The withdrawal of U.S. forces could also spell trouble for their closest ally in the region, the Kurdish People's Protection Units (YPG), who Turkey considers a terrorist group. The Syrian government has said that the areas controlled by the Kurds would eventually revert to government control. A U.S. official told Reuters that the U.S. military is planning to completely withdraw from Syria by the end of April.